[126 Pages Report] The global intelligent completion market was valued at USD 1.53 billion in 2017 and is projected to reach USD 2.16 billion by 2023, at a CAGR of 6.05% during the forecast period. This research study involved the use of extensive secondary sources, directories, journals on power generation technologies, and other related rental markets; newsletters and databases such as Hoover’s, Bloomberg, Businessweek, and Factiva, among others, to identify and collect information useful for a technical, market-oriented, and commercial study of the global intelligent completion market. The primary sources include several industry experts from the core and related industries, vendors, preferred suppliers, technology developers, alliances, and organizations related to all the segments of this industry’s value chain. The research methodology has been explained below. After arriving at the overall market size, the market was split into several segments and subsegments. The figure given below illustrates the breakdown of primary interviews conducted during the research study on the basis of company type, designation, and region. 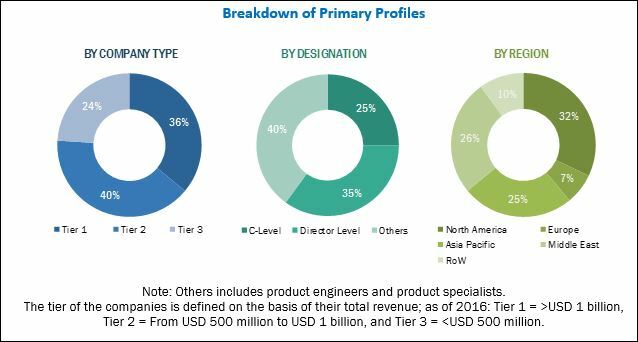 Major players operating in the intelligent completion market include Schlumberger (US), Halliburton (US), BHGE (US), Weatherford (Switzerland), and National Oilwell Varco (US). According to IEA, the demand for oil will continue to grow until 2040, and the use of natural gas is expected to increase by 45% by 2040, with industries expecting to be the largest demand generating sector. The oil & gas operators are looking forward to better and more efficient ways to exploit these resources. To maximize the production and improve the economics of reservoirs, oil & gas operators are looking for a wide range of sophisticated completion strategies that utilize real-time data monitoring with remote-controlled sliding sleeves or variable chokes. With the use of intelligent completions, oil & gas operators can manage the production in a better way and eliminate or reduce interventions and associated production downtime, well costs, and risks. The higher the number of wells that are integrated with intelligent field systems, the greater economic efficiency would be achieved. The adoption of intelligent well technology equips oil & gas wells with monitoring systems enabling the operator to decrease operational costs, optimize production, and manage the entire field. Further, the productivity enhancement is of significant importance as it delivered financial advantage and increased ROIs. The oil & gas operators can introduce additional capabilities for evaluating productive formation, thereby allowing the optimization of production and waterflood systems. Moreover, intelligent completions provide other important advantages such as production from several formations, zonal isolation, control of production rate from different intervals, and enhancement of artificial lift efficiency. The major factors that result in higher cost of intelligent completions are initial design, components, installation, and maintenance. This would require the oil & gas operators to increase their CAPEX for IC which has traditionally been higher when compared to traditional completion techniques. Hardware and other sensors should help ensure sufficient coverage of data and minimize the redundancy for high-value measurements of overall equipment effectiveness (OEE). Moreover, high-precision hardware sensors are usually more costly than low-precision sensors and find application in critical areas. The installation and the cost of components and systems coupled with their reliability have been a pertinent issue the industry has been dealing with in terms of intelligent completions. However, in the coming years, the industry is expected to diversify the product and system portfolios to address different types of markets by introducing technologies that help lower the costs by a third to half. New deepwater discoveries since 2012, in India, Australia, Russia, China, Nigeria, and Norway have bolstered E&P activities in these offshore regions. In June 2017, the Oil and Natural Gas Corporation (ONGC) discovered an oilfield with approximately 20 million tons of hydrocarbon reserves in high offshore fields in Mumbai. The Arctic region has seen vast levels of petroleum resource development over the past few decades. The Arctic region is characterized by extreme operating conditions. For example, the region is capital intensive and political regulations pose threats. This offers attractive opportunity for offshore drilling & completion service providers, as offshore services aid the completion processes in locations with lesser known topography. These offshore deepwater locations are in the middle of the ocean and monitoring the levels of E&P are limited to operators who are available onsite. However, integrated and automated operations are likely to ensure data monitoring from far-flung locations enabling effective decision making. Kuwait Oil Company awarded a contract to Tendeka with its Inflow Control Device (ICD) technology to enhance production through effective reservoir management. BHGE was awarded a contract from Petrobel for phase two of the “supergiant” Zohr Gas Field situated in the Mediterranean Sea, off the Egyptian coast. Halliburton launched the JetPulse high-speed telemetry service to enhance reservoir understanding and faster decision making. BHGE launched FASTrak Prism fluid analysis and sampling while drilling service. The service uses advanced sensors and technology to collect and deliver reliable, high-quality fluid samples and real-time reservoir characterization for overall well completion and production strategies. Halliburton acquired Summit ESP to expand its artificial lift capabilities and enhance its market position in North America. 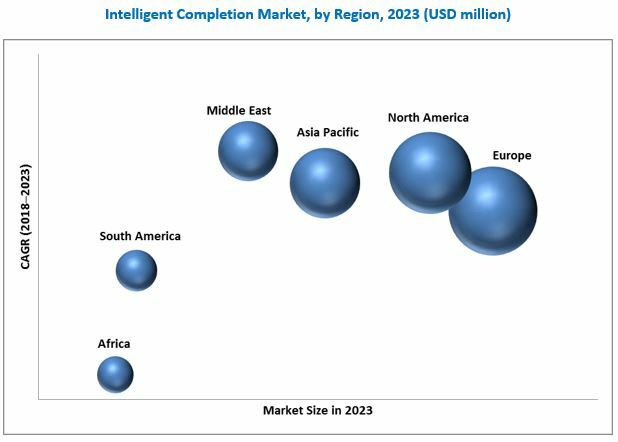 The global intelligent completion market is estimated to be USD 1.61 billion in 2018 and is projected to reach USD 2.16 billion by 2023, at a CAGR of 6.05%. Increase in production of oil & gas wells and improved economical and operational benefits are the major drivers of the intelligent completion market. The report segments the intelligent completion market, by application, into onshore and offshore. The onshore application segment is expected to dominate the market in 2018 owing to the rise in deepwater and ultra-deepwater drilling activities. Moreover, the cost incurred in the oil & gas activities such as drilling and well completion is less in onshore when compared to offshore applications. Based on type, the intelligent completion market has been segmented into complex intelligent well completion and simple intelligent well completion. The simple intelligent well completion segment is expected to hold the largest market share in 2018. Simple intelligent well completion helps to enhance the performance of the wells and finds its application in horizontal and multilateral wells. It provides downhole monitoring system to facilitate reservoir monitoring. This type of intelligent completion includes pressure and temperature sensors, distributed & temperature profiling, and downhole flow meters. The adoption of simple intelligent well completion will drive the simple intelligent well completion segment. Based on component, the intelligent completion market has been segmented into hardware and software. The hardware segment is estimated to lead the market in 2018 and is expected to grow at the fastest rate during the forecast period, as it consists of various components such as control devices, monitoring devices, and others. (progressing units and communication network). In this report, the intelligent completion market has been analyzed with respect to 6 regions, namely, the Asia Pacific, Europe, North America, South America, the Middle East, and Africa. Europe is expected to hold the largest market share in 2018 and the Middle East is the fastest growing market during the forecast period. Factors such as increase in oil & gas activities and availability of several mature oilfields in the North Sea are driving the intelligent completion market in the European region. Exploration activities in offshore and arctic regions and increased adoption of data driven technologies for real-time monitoring in the oil & gas industry can create opportunities in the intelligent completion market. However, concerns regarding data privacy and high cybersecurity risks could restrain the growth of the market, leading to declining profits. Some of the leading players in the intelligent completion market are Schlumberger (US), Halliburton (US), BHGE (US), Weatherford (US), and National Oilwell Varco (US). Contracts & agreements and new product launches were the most widely adopted strategies by players to ensure their dominance in the market. Digital transformation and automation are emerging trends in the oil & gas industry. The rapid digitalization in the oil & gas industry has taken place by transforming traditional processes with innovative technology to deploy minimum workforce over remote onshore and offshore exploration sites. The decline in oil prices, frequent budget and schedule overruns, and climate change accountability are issues faced by the industry. The application of technologies such as robotics, process automation, DCS, intelligent completions, and SCADA systems in the upstream segment helps automate the control process and offers operators a real-time view for optimization. Benefits realized through this are process automation, production efficiencies, reduced costs, and elimination of the need for manual data collection. This provides better routine maintenance of equipment and spotting of areas for improvement, thus minimizing losses. Furthermore, the usage of cloud computing technologies is expanding in many applications or systems such as consumer-based applications to enterprise management systems. Cloud analytics is quickly gaining momentum and has become an essential need for oil & gas companies to deploy their business tools globally at low capital costs. The concept of storing data in the cloud and virtually displaying the data is becoming prominent because of the ease of availability and reliable service providers. These factors are expected to provide excellent opportunities for the intelligent completions market during the forecast period. The increasing application of automation and use of connected technologies have increased the risk of cybersecurity and industrial espionage. Cybersecurity in the oil & gas sector is critical to protecting the confidential field data. Operational systems that include production line management and oil & gas monitoring in the oil & gas sector are used to monitor and control operations across the entire value chain. At the drilling, completion or production stage, the availability of confidential process data is the primary focus for most security engineers in the field. As automation and digitalization data is used for predictive maintenance, planning, and execution of many exploration and development activities, it requires access to multiple oil & gas data sets. This is a crucial task as most of the data platforms are consolidated and require extensive computing power, owing to which the machine data or parts of it are required to be stored at the vendor’s data center. In 2015, the US government placed a cybersecurity law that was passed by the Senate. The law allows the sharing of internet traffic information between the US government and oil & gas companies. Hence, the oil & gas-related data must be protected under the Federal laws, and any breaches or failure to maintain its integrity can result in legal and financial penalties. Baker Hughes collaborated with Sonatrach to form a new company named Arzew Industrial Zone to strengthen Algeria’s position in the upstream oil & gas market. Weatherford partnered with Intel Corporation for utilizing IoT to enhance the efficiency and profitability of production operations in the oilfields. Baker Hughes and KBC, a Yokogawa company, collaborated to provide integrated asset performance management and digital process simulation capabilities across the value chain. 12.9 Omega Well Intervention Ltd.